On this day, April 23rd 1898, Spain declared war on the United States of America. Tensions had been running high between the two countries, largely due to American's meddling during the Cuban War of Independence. "Yellow journalism" from two of the biggest names in American journalism, Joseph Pulitzer and William Hearst, whipped up public opinion to a fever pitch which was only heightened by the mysterious explosion and sinking of the USS Maine on February 15, 1898. Political pressure and public opinion pushed President McKinley into a war with Spain he had hoped to avoid, and the US Navy began a blockade of Cuba on April 21st 1898. Spain declared war on April 23rd. On April 25th, United States Congress declared that the war had begun April 21st with the Cuban blockade. This began the ten week war which was fought mainly in the Pacific and Caribbean. We often come across interesting pieces of historical memorabilia from the Spanish-American War. Public opinion was strongly in favor of the war and approximately 125,000 soldiers from across the nation volunteered to fight. This flag remnant is a particularly interesting piece of Spanish-American War memorabilia that came to us from an upstate New York estate. This battle flag fragment flew over the USS Brooklyn, a United States Navy armored cruiser. The USS Brooklyn was launched in 1895 and then became the flagship of the Flying Squadron under Commodore W. S. Schley on 28 March 1898. The cruiser was a key vessel in the Battle of Santiago de Cuba on July 3, 1898, a decisive battle in the American victory over the Spanish Fleet. This flag fragment is framed under glass with a hand written note reading: A piece of the battle flag of the Brooklyn which flew [.....] Maine on July 3, 1898.. (We are unclear as to the reason for the mention of the USS Maine on the tag.) The tag is printed with the name "Lieutenant Rush, and U.S.S. Brooklyn". A previous owner framed the flag under glass and attached a printed version of the "Star-Spangled Banner" to the back. The Spanish-American War helped define a new American identity: a nation that had recovered from the scars of the Civil War to take a prosperous and influential role on the international stage. The general popularity of the war influenced politics, the public's opinion on American imperialism, and diplomacy for years to come. Theodore Roosevelt returned from the Spanish-American War as a nationally known hero and this acclaim quickly acted to project him to office as Governor of New York, and then as Vice President of the United States. Roosevelt was a very visible and very popular figure from the war; he helped form the famous Rough Riders, a combination of wealthy Easterners and Western cowboys. 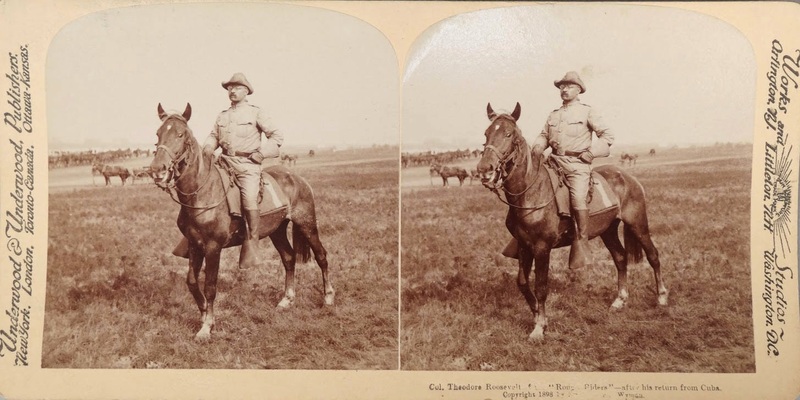 His high profile acts of courage made him a popular figure in the headlines; stereoviews like the one above depicted Theodore Roosevelt upon his return from the Spanish-American War were immensely popular. You never know what you're going to find at an estate, and stumbling across these unique pieces of military history is very exciting. Take a closer look at the Spanish-American War USS Brooklyn battle flag remnant, or check out all of our new estate finds by visiting our store.